Peacefully in his sleep on Wednesday February 6, 2019, our cherished son, brother, grandson and friend, Devin Neal Dixon was released of his illnesses and disabilities into loving arms where he is finally free. Devin was a joy and inspiration to all who were privileged to know him. He was a testament to the power and strength of one’s soul. The purity of his soul inspired, influenced and blessed all who knew him. He came into this world as a miracle and left this world as a miracle. 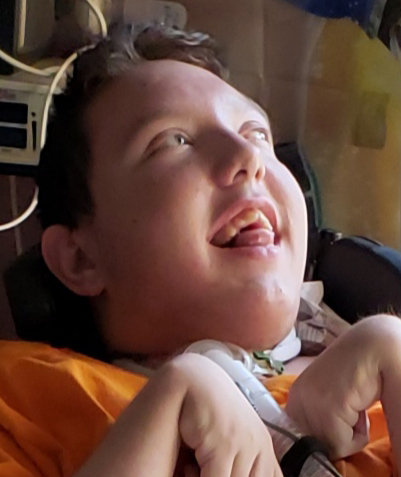 Having a stroke before birth left Devin with severe disabilities, born on February 16, 2000 in Dublin, GA to Benjamin Neal Dixon & Jodi Rae (Murray) Dixon. He grew up in Alexandria, MN where he graduated in 2018. Devin loved nothing more than watching WWE Wrestling, GA Bulldogs football and his favorite movies. Though he was nonverbal, he had no problem getting his wants, needs and opinions across with the brightest infectious smile and mischievous eyes. However, fortitude, strength, endurance and sheer stubbornness allowed Devin to live almost nineteen years tightly wrapped in the love of his family, friends and care providers. His family was privileged to share their lives with him here upon earth, to learn from his courage and marvel at his constant joy and happiness in the face of struggle. All who know Devin will be eternally changed by his presence and forever changed by his passing. His presence inspired all those who knew him. With all of Devin’s medical mysteries he helped to educate the doctors, nurses and students of his extensive medical care team. He opened their hearts as well as their eyes. A special Thank You to Dr. Brian Carlsen for getting us through almost nineteen years of the craziest roller coaster ride ever! Thanks to Next-Step Home Care for taking care of Devin like he was one of their own – he loved every one of you! Thanks to the Minneapolis Children’s Hospital – there are so many people I can’t begin to list everyone. Just know all of you helped Devin live as blessed of a life as he could. You helped us laugh, cry, have hope and know when to gracefully let go. Lastly, every other person and agency that touched Devin’s life – Thank You. I hope he left a lasting touch in your life too. Devin was preceded in death by his grandmother, Anne Gardner. Devin is survived by his parents, Benjamin & Jodi Dixon of Alexandria; brother, Thomas Dixon of Alexandria; sister, Ashley Dixon of Alexandria; grandfather, Bennie Dixon of Rentz, GA; grandparents, Lennie & Jane Murray of Alexandria; and many special friends and caregivers. A funeral service will be held at 2 PM Friday, February 15, 2019 at the First Congregational United Church of Christ in Alexandria. Visitation will be from 1 to 2 PM Friday at the church. In lieu of flowers memorials are preferred to the Children’s Hospital in Minneapolis.